Hospitality is an amazing and uniquely challenging industry. Change is inevitable and constant. Mergers and re-brands are a way of life. What’s true today might not apply tomorrow. Graduates of the School of Hotel and Restaurant Management in The W. A. Franke College of Business have the dexterity needed to be more than ready for the challenge. They’re able to see around obstacles and act quickly to find solutions. These are the skills that employers demand. Guided by the Oath of Hospitality Professionals, our HRM students bring a depth and breadth of commitment to hospitality that you won’t find anywhere else. The strong relationships you build with your HRM peers, faculty, and staff will turn into a powerful and supportive network throughout your career. In addition, our industry partners and alumni are dedicated to student success and student engagement. Our in-house workshops and networking events—like our Pathway programs, Spotlight Visits, and the HRM Career Fair—are designed to connect you with employers in the field from your first moments on campus. Throughout the year, we host events that are often student-run. These events are fun and give students great experience, but often mean more. Students work with alumni and industry partners to raise money for HRM scholarships, as well as increase networking and industry engagement. From Casino Night in early fall to the golf tournament in late spring, the students have an opportunity to work all year with faculty, staff, and industry professionals to get hands on experiences. 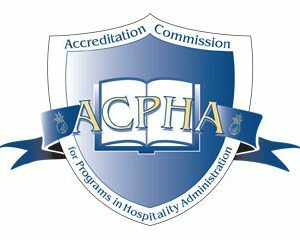 The School of Hotel and Restaurant Management is accredited by the Accreditation Commission for Programs in Hospitality Administration (ACPHA). This accreditation was reaffirmed in spring 2018 after a review team assessed the School’s achievements and compliance with several quality assurance standards. We are proud to have exceeded the standards and to continue as an accredited School. CEOWORLD Magazine has issued its 2018 rankings of the Best Hospitality Programs in the World. NAU’s School of Hotel and Restaurant Management ranked number 7 in the world and number 6 in the United States.